Over last few years, it had been thought that Wi-Fi was designed to be used only in commercial establishments or homes alone. Nobody ever imagined that Wi-Fi could form an important part of a camper’s life. Most campers don’t like complicated stuff and Wi-Fi offers the simplicity that is desired by getting rid of the messy network cables used on tablets and laptops. The wireless way is the simplest method to have a Wi-Fi connection in your recreational vehicle. With that, you will keep yourself entertained all through. The only thing that makes Wi-Fi connection complicated is the remoteness of most of the campgrounds. The greatest news, however is that with the help of the best RV Wi-Fi booster, your connectivity in the most remote of places will be improved. But what are these Wi-Fi boosters? Also known as Wi-Fi extenders, Wi-Fi boosters are simple devices that capture and rebroadcast existing Wi-Fi networks. This results in a more reliable signal regardless of how far you are from the router. Setting up a Wi-Fi booster doesn’t need a lot of effort. All you need to do is to isolate one spot from where the signal will be broadcasted. This is the place where you will have to point your antennas just as you do with your RV TV antennas to pick the signals. After you are done with choosing the spot, you’ll only be required to hook your antenna to the booster for the best signals. The very best of products on our list is the BearExtender Outdoor RV Wi-Fi Booster. What makes it the best is the fact that it is a long-range booster (802.11n 2.4 GHz). It has majorly been designed for the Microsoft Windows Vista, Windows 7, 8/8.1 as well as Windows 10 (whose use requires downloading the manufacturer’s support page) personal computers. Another standout feature it has is the built-in 10 dBi directional antenna. It also has an integrated and premium shielded 16 feet USB cable that just draws power from the personal computer. It doesn’t need any AC supply of power. This Wi-Fi booster is a very versatile type that can be used even in boats and at home. Its enclosure has been pre-treated using an anti-UV as well as anti-corrosion protective layer. This earned it an IP65 certification for being dust and water resistant. This booster can be mounted in three different ways; using the Velcro pole-mounting strap, detachable tabletop tripod and also using an adjustable metal pole. However, take note that this is not an LTE, cellular, 3G or 4G booster. It is also not compatible with Android, iOS, Mac OS X, and Windows RT tablet. This booster does reception of signals in a single direction. It is for this reason that you might experience weaker signal reception in the opposite direction. The reception range is also dependent on the environment; higher placement can give improved results. Its dimensions are 8 by 1 by 4.25 inches and weighs just 12 ounces. 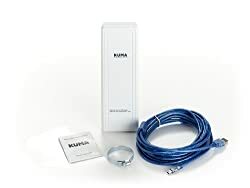 KUMA RV Wi-Fi booster is a great alternative pick for you. It is cheaper compared to the first product above. It is very versatile and can be used in a caravan, boat and wagon besides the RV. This product is capable of providing you with a reliable connection from a Wi-Fi signal that is far off. 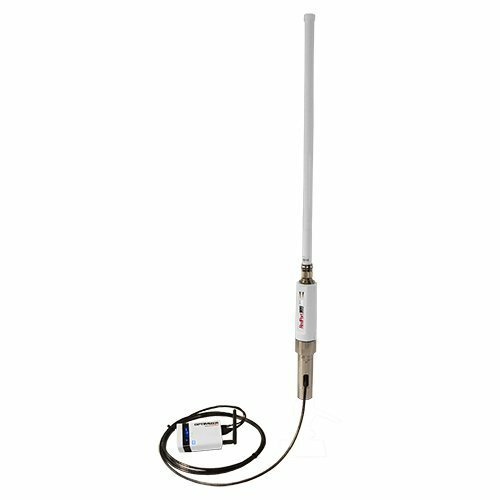 It has a 16 dBi antenna which is a high gain type of antenna. You can use the boosted signal in a variety of devices. What you have to do is simply set up your computer as a Wi-Fi hotspot for the other gadgets. It doesn’t require much effort to mount with just screwing or pole mounting enough to keep it in position. Once you have mounted it outside your RV, connect the booster to your computer using the provided 5-meter USB cable. In ideal weather and environment, this booster is capable of providing strong signals even at a distance of 1.5 kilometers. This range is directional and, therefore, is of great quality. Expect minimal signal interference with this Wi-Fi booster. The package that the booster comes with also includes the 5-meter USB cable, full installation instructions, pole mount clip and a full driver CD which can be installed on most operating systems. It weighs 1.3 pounds with its dimensions being 5.6 by 11.8 by 3 inches. 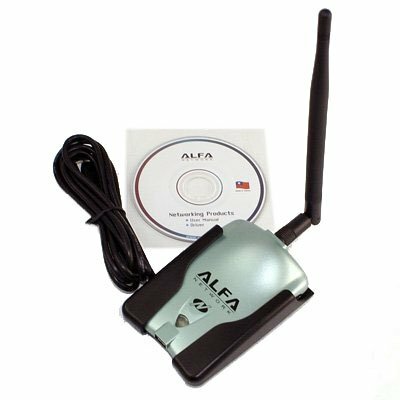 ALFA RV Wi-Fi Booster is the cheapest but one of the high-quality boosters on our list. The combination of its high power with the +9 dB 15’ 2.4GHz Hi-gain antenna which is foldable makes it a great and pocket-friendly product. It has an estimated range of 2 kilometers but majorly depends on the environmental conditions. One other good thing about this booster is that it is compatible with almost all desktops, laptops, Macs and PCs. This package comes with two antennas which are the mini 5 dB gain antenna and the 9 dBi high gain antenna. The former is a 4-inch rubber antenna that can be removed and upgraded. Weighing just less than 2 ounces with measurements of 3.5 by 2.5 inches, it is a perfect Wi-Fi booster to travel with. Its 2000mW output power makes this small device so powerful. As long as you have a computer that has a USB port, this booster will work to your expected standards. It works with Linux (kernel 2.6.6 and above), Macintosh (OS version 10.4) and Windows Vista. The highest data transfer rate that you can enjoy with this booster is 150 Mbps. It also has an LED indicator that can be used for diagnostic purposes. What’s more, the booster is also compliant both in the United States and Europe. RedPort Wi-Fi booster is the most expensive one in our list. The price, however, matches its features and merits. You can access internet connection up to a distance of 7 miles when you are on the high-power hotspots and from 0.5 to 2 miles on the standard hotspot when you have this booster. Once this booster has rebroadcasted the signal, you can actually connect a variety of computers, tablets, and phones for use. This has been made possible by the Optimizer Wi-Fi hotspot that comes with the purchase of this booster. The product comes with a 120-200V adapter, but it can as well be hardwired or powered using the 12-volt standard car charger connected to a power supply from your RV batteries. With the purchase, you get a 10-meter Ethernet cable to use to connect the booster and the computer. It weighs 1.13 pounds with dimensions of 28 by 1 by 1 inch. What’s more, this Wi-Fi booster is backed up by a limited warranty of 1 year. It also comes with installation instructions that are simple and easy to understand. The durability of this product is also unquestionable. Power cable and Cat 5e cable are integrated into one with no protection to keep it from breaking. A Wi-Fi booster is an essential gadget for RV camping or living. You will need to know what is happening in your environs and the world at large. Apart from using a portable pocket radio to listen to news, you need to be updated on what is going on in the world at large. This is only possible if you have access to strong internet connectivity and this is where the booster comes in. Secondly, the booster is always easy to install and use. There is no hassle around this gadget. What you simply have to do is plug the booster into your PC’s USB port. Follow this by installing the drivers that are part of the accompanying CD. By just following those simple rules, you will be done. If you work online, then you know that accessing the internet is important for your life. Would you stop working just because you are on a road trip? You shouldn’t. Work from anywhere without any worries about Wi-Fi connectivity. You can even gather information about the GPS and present weather conditions. The booster, just like its name suggests, enhances the signal. The use of multiple antennas with a single amplifier improves internet signal. The much-advanced reception is what you and the PC needs. Since your internet connectivity won’t be limited as a result of the installation of the booster, you will be in a position to communicate with your relatives and friends with a lot of ease. You’ll have improved your RV living standards as well by listening to your favorite music, surfing the web and watching movies among others. To enjoy the above benefits, ensure that your booster is placed directly facing the transmitter. A USB extension cord can help you a great deal if you want to have the booster closer to the transmitter. The closeness results in much stronger signals. It is advisable to check on the condition of the existing router before deciding to buy a booster. This is a more effective approach as there won’t be any change even if you buy a new booster if at all the problem is on the router. If your router is still new, then the best way to solve your connectivity issues is through the installation of a new booster. But how will you get the best from the many currently available in the market? This is the question that we want to answer in this section. The best RV Wi-Fi boosters are designed differently from one brand to the next. However, they can majorly be categorized into 2 main design categories. The first category is based on their composure which is basically small plastic blocks. These blocks are plugged directly into a wall. They have the LED lights which are basically used as indicators for signal strength and power. The other category is the RV Wi-Fi repeater that looks like routers. It has its own power supply as well as an aerial. The first design category is less noticeable. Whichever the design you settle on, make sure that it will perfectly fit in the proposed site on the wall. This is because there are some models which are very bulky. The second category has more features and is always considered the best. You have to look for something that will be easy to connect. You can do this by learning more about the network name and SSID of your router. This includes its password or key as well for the purposes of setting up the connection afresh. This information is available on the underside or at the back of the router. The easy to connect Wi-Fi boosters should come with a repeater as well for purposes of having a set up that is Wi-Fi protected. Such setups are easy to connect; you simply have to press your router’s button plus the wireless boosters. The pressing of the buttons is enough to have both devices establish a connection. The router will be transmitting highly valued data to your booster making its future connectivity effortless. The booster you are about to buy should be able to support your current Wi-Fi connection and router. For instance, why should you buy a fancy booster when the existing router cannot support it in the first place? You have to carry out some research on specific booster standards that the router you have can support. You have to check on the router and booster’s speed to ensure their compatibility. The speed of the booster should not surpass that of the router. The booster will only be responsible for rebroadcasting the signals received from the router. This is why compatibility is a serious issue that must be looked at prior to making an order. The speeds of these routers and boosters are always denoted by Mbps. What are the additional features that the booster has apart from the basics? How many Ethernet ports does it have? This port is very important as it is at this point that you will be able to plug in a device with a wired connection. This leads to advanced speed as well as a minimized number of gadgets attempting a wireless connection. Does the WIFI booster have audio streaming abilities? Well, there are some boosters that have this feature. It is an additional one that can be of great help to you. There are also these ports for connecting speakers and headphones. Any boosters with the additional ports are good in ensuring that you can choose and stream music from your smartphone or laptop. If the booster has all the basic features with additional one or two others, you can have it for your use in the RV. Your needs should be supported the most by the booster you have to buy. High-security standards are very important for RV Wi-Fi boosters. The booster should guarantee protected access to the Wi-Fi. This can always be set using the WPA2-PSK (AES) form. Your network should not be easily accessible to all especially during these days where hacking is the order of the day. The encryption technique that the security feature offers helps prevent whoever doesn’t have the password to your network from connecting to it. If you own an older router that doesn’t support WPA or AES, then you should first upgrade it before you bring in a new booster. ​https://enjoythewild.com/best-hammock-underquilts/​​​Regardless of the area you plan to have a road trip or go camping; connectivity is a must thing for you. You shouldn’t disconnect yourself from the rest of the world at any given point as you are likely to miss a lot. The Wi-Fi booster will ensure that even in the most limited of Wi-Fi connections, you will still be able to enjoy doing a lot online. 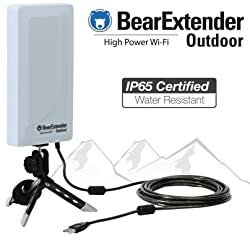 And without any doubt, the BearExtender Outdoor is the best RV Wi-Fi booster. This long-range extender is capable of broadcasting the weakest of signals for use in all Microsoft Windows PCs. It is powerful, relatively affordable and is durable due to its dust and water resistivity. It is an easy to install booster with 3 different installation ways. This is what you need to have during your next road trip. This is the best guidance you could ask for in your journey around RV Wi-Fi boosters.